David D. Fleming, 86, Monmouth, died at OSF Holy Family Medical Center in Monmouth, on December 14, 2009 at 12:55 pm. 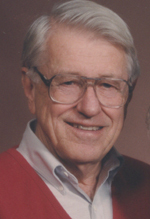 Fleming was born on Oct. 12, 1923 in Galesburg, the son of Herbert M. and Ruth Diehl Fleming. His 62 year marriage to his beloved wife Mary M. Huntoon began on June 7, 1947 in Glen Ellyn. She survives him. Dave also is survived by his 3 sons David Jr., Michael, and Joel. Dave was an active community leader and also very involved with the health of Monmouth College and Ipava High School. A true character to many former Monmouth College President Bruce Haywood had this to say about Dave, "Curiously, my fondest memory of him is of Dave in his hospital room, setting aside the newspaper to welcome my wife and me as we entered. Ill as he was toward the end, his happy spirit never failed him."